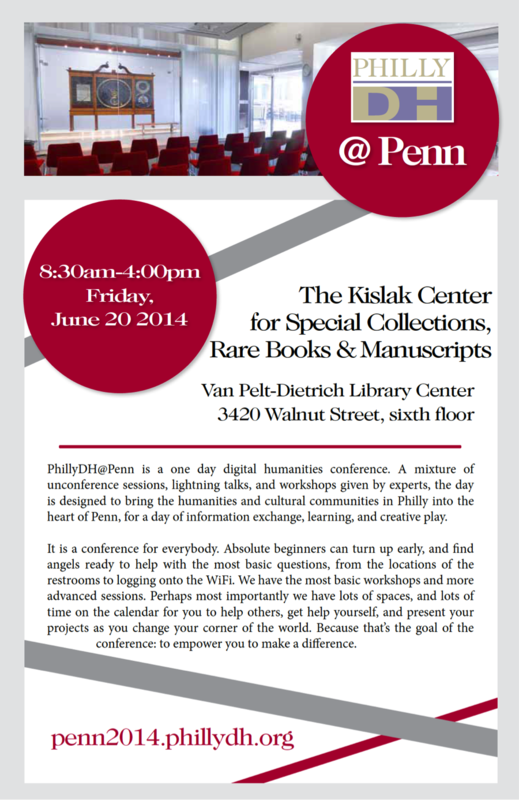 We are excited to announce that PhillyDH@Penn will be back for a second year on Friday, June 20, 2014, in the Kislak Center for Special Collections, Rare Books and Manuscripts, 6th floor of Van Pelt Library. PhillyDH@Penn is a digital humanities unconference, planned by folks from the PhillyDH group and Penn Libraries. Last year’s unconference drew attendees working in schools, libraries, museums, cultural and historical institutions around the Philadelphia-area and beyond. This year’s unconference will feature a lightning round, hour-long workshops sessions, and many unconference sessions (learn more about unconferences). Anyone at any level of DH scholarship is welcome to attend – we have the most basic workshops and more advanced sessions. Most importantly, PhillyDH@Penn provides an opportunity to learn, network with colleagues, and bring this knowledge back to your own DH endeavors. Registration is now open. We are also looking for unconference session ideas, to be decided the day-of by participants. If you can’t think of a session at the time you register, you can use another form to propose a session any time up until (and even the morning of!) June 20. We look forward to a dynamic day of learning and networking, and we hope to see you there!